SourceOne's Plugr Tow Pro is a 45-inch self-contained attachment with a universal mount for operation behind virtually any tow vehicle, including riding mowers, four-wheelers and small utility vehicles. Plugrs are reciprocating aerators with spoons power-driven deep into the ground by an independent engine to make holds deeper and cleaner. An electric-start, 12-hp engine powers the aerator and 12-volt battery (included) powers the control panel. Tow Pro's independent power allows mowing and aeration without dragging down mower power. Capacity is up to 84,000 square feet per hour (approximately 2 acres) at 4 mph. The patented ABT allows users the ability to work all their "problem areas" with a single exercise. The ABT doesn't offer any compromising exercises. In fact, it incorporates not just any movements, but the best for both the mid-section and the lower body. For the abs, the ABT offers a synchronized, coordinated upper/lower body abdominal movement. For glutes, hamstrings and quads, ABT seamlessly incorporates the time-proven double-lunge motion. By adjusting the speed to a faster setting, the ABT can be used for an intense cardio workout. 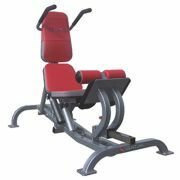 The ABT's simple yet elegant design integrates these distinct, complete exercises into one seamless, easy-to-use motion. Pentair Water Commercial Pool & Spa announced an expansion to its popular EQ Series commercial pump line. The EQ Series, designed for commercial aquatic facilities and large, high-end residential pools, is now available with 575-volt three-phase motors. The new pump is a high-performance, low-noise-level unit with Pentair's unique EQ Series closed impellers that guarantee a longer motor life even under the stress of higher loads. The all-plastic pump construction is designed for maximum hydraulic performance and maximum corrosion resistance. The EQ 575V is lightweight for easy, one-man installation and is available in 5-hp, 7.5-hp, 10-hp and 15-hp motor options. Newstripe's all-new Dirt Doctor JuniorTM infield groomer was designed to be pulled by four-wheel-drive utility vehicles or compact tractors. Weighing in at just 600 pounds, Dirt Doctor Junior replaces three separate implements in one unit. It can plow, pulverize, drag, compact and finish-drag a 4-foot-wide path in one pass. The three-position reversible harrow teeth, four-position pulverizer bar and wheels are quickly and easily adjusted with no need for tools. The optional 6-foot finish drag with reversible lead bar can be detached and used as a separate pull-behind drag for between-inning touch-ups or removing ridges and low sports. SnowEx introduced the new 7500 bulk spreader. An economically priced V-box spreader, the 7500 offers all the advantages of polyethylene construction at the price of standard steel-constructed alternatives. Featuring a 1.4-cubic-yard capacity material hopper constructed entirely of polyethylene, the 7500 eliminates the corrosion concerns and constant maintenance commonly associated with standard steel V-box alternatives, and is much lighter as well. Additionally, the 7500 features an exclusive poly enclosure around the spinner assembly. Intended for use with pickups, the 7500 features the same patented multi-angle hopper and inverted-"V" salt/sand baffle design found throughout the SnowEx line of V-box spreaders. The 160-page Recreation Supply Company commercial swimming pool catalog offers most any item you might need for your pool facility, aquatic athletics or swim programs. Ordering is easy and convenient. In-stock orders are typically shipped within one business day. 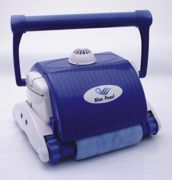 Water Tech introduced its newest commercial-grade, automatic, robotic swimming pool cleaner, the Blue PearlTM . This new cleaner uses the latest robotic technology, offering one- to three-hour variable cleaning and super climbing brushes to reach the toughest spots on pool walls. The Blue PearlTM works with an external timer and comes complete with an automatic safety shut-off. This affordable unit can clean any large pool in two hours or less. Broyhill's new TerraSportTM utility vehicle boasts a 1,500-pound total capacity and robotic-welded tubular steel frame construction for exceptional strength and durability. With a 16-hp Briggs and Stratton engine, continuously variable transmission (CTV), power steering and multi-lead spring, dual shock suspension, the TerraSportTM provides a smooth ride at speeds up to 20 mph. Optional rear cargo box offers a unique 1/3-2/3 design, making room for a toolbox or sprayer tank, and is conveniently located behind the seat. Steel or wood boxes easily convert to a 48-by-48-inch flatbed. Accessories include Broyhill's VacMate® vacuum, Refuse Mate® 2.0-cubic-yard refuse box, hydraulic box lift, grooming attachments, 25-gallon sprayer and 10-foot spray broom.